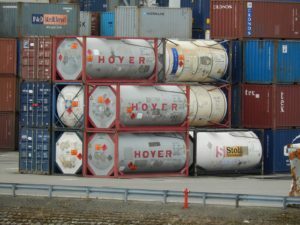 Russian stevedoring companies, following the notifications of the respective port authorities, have begun informing their clients that they suspend handling dangerous goods of all classes from 25 May till 25 July, due to increased security measures imposed by the Russian government for the period of the FIFA World Cup, Russian business daily Kommersant informs today. Thus, Container Terminal Saint-Petersburg (CTSP), part of UCL Holding, asks the customers to take this into consideration while planning their shipments. In case a shipment cannot be suspended, CTSP recommends to contact the regional inter-agency operational office for the approval of such shipment’s port handling. The inter-agency operational offices are supervised by regional departments of the Federal Security Service (FSS). The 2018 FIFA World Cup Russia will take place on 14 June – 15 July, 2018 in 11 Russian cities, including the port cities of St. Petersburg, Kaliningrad on the Baltics and Sochi on the Black Sea. The World Cup security measures were introduced in Russia by the Presidential decree dated 9 May 2017, followed by the government’s order of 9 June. However, lacking a detailed description of hazardous substances, these regulations allow for a wide interpretation, leading to a suspension of handling not only radioactive materials but any type of chemicals. For instance, in December 2017, the Harbour Master of the Large Port of St. Petersburg, referring to the letter of the Federal Agency “Rosmorrechflot”, informed the port operators that handling of all dangerous chemical, biological, toxic, radioactive and explosive substances will be suspended during the World Cup. Kommersant’s sources say that port operators asked Rosmorrechflot to specify which particular hazardous goods are subject to this limitation. But the published clarifications have not brought light to the issue and it is recommended to contact FSS inter-agency operational offices for more explanation, which have their own opinion, often excessive. This may result in a temporary freeze on imports of all explosive, toxic and radioactive cargoes through Russian Baltic and, possibly, Black Sea ports. Among those who might be affected are St. Petersburg car makers (Toyota, Hyundai, Ford, Nissan) and Avtotor assembly plant in Kaliningrad (BMW, Hyundai, Kia), which may face shortage of auto components, such as batteries, paint materials, airbags. Commenting on the situation, Global Ports (First Container Terminal, Petrolesport, Moby Dik, Ust-Luga container terminals on the Baltic Sea) says that the restrictions on handling and storing dangerous goods is a normal world practice for the period of large-scale events. The company plans to strictly follow the government’s orders and to recommend its customers to adjust their logistics accordingly. Alexey Shukletsov, Executive Director of Fenix (operator of Bronka port in St. Petersburg) notes that the share of hazardous goods in ports’ container throughput is limited to 2.5-3%. He believes that the current restrictive norms are adequate: “The customers, probably, will experience some inconveniences, but the handling limitations were announced in advance, so that those who need supplies, have time to deliver them”.